Paige Dolecki - Stampologist: Here comes Peter Cottontail with CTMH Mayberry and A Hop! Here comes Peter Cottontail with CTMH Mayberry and A Hop! Okay, how cute is this bunny? 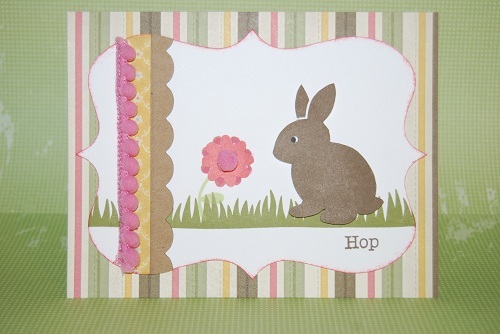 He comes from one of our new A size ($7.95) stamp sets called "A Hop". Did you see the new pink ribbon collection in the Spring Idea book with the pom-pom ribbon? How fun does it look on this card - I even used one pom-pom as the center of the flower. Once again I couldn't resist adding a piece of our Kraft self-adhesive borders to a project - these things are da bomb! Love this card. Mayberry looks so cute and Easter-y! CTMH Blessed April Stamp of the Month Blog Hop!